Arctic Forecast Verification Update | Watts Up With That? On June 28, I generated a forecast projection for Arctic ice during the remainder of the summer, seen below. Does this mean that I need to increase my forecast minimum to a higher number? No, I don’t have any plans to do that, because I expect melt to occur faster during the remainder of the month. NCEP is forecasting warmer temperatures over the East Siberian and Chukchi Seas for the next two weeks. 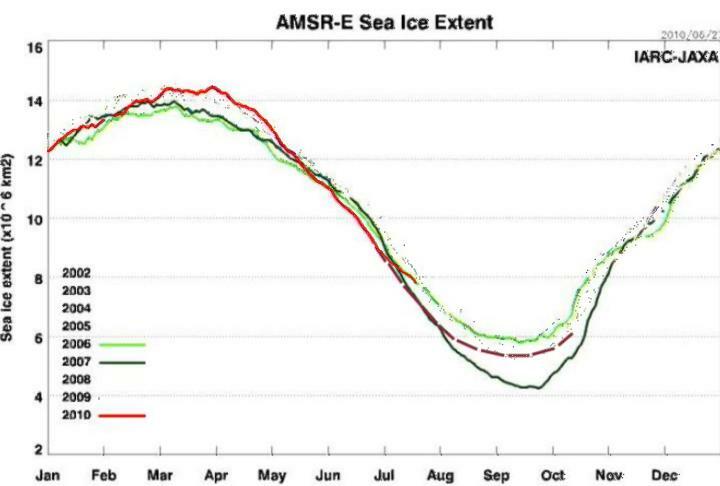 We are already seeing evidence of this in the DMI graph of 30% concentration ice. I expect to see that JAXA will move closer to my 5.5 million km² forecast for the summer minimum. 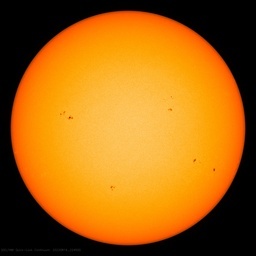 July 20, 2010 in Arctic, Forecasting. Hey Steve!….are you “The Spy who came from the cold”? Brrrrrrrrrrrr! Anothony, how did you come up with your forcast? It seems that you are implying you have some model or at least a data based projection but I have not seen any equation. My ‘prediction’, i.e. 5,3001,000sqkm, is entirly data based. I made plots of dA/dt vs. A, looked at multiple years and determined that the average gradient, when the extend goes from 10e6sqkm to 8sqkm, correlates to the minimum. I didn’t propose a mechanism. I’m interested to see if you have some quantitative mechanism. Take all SEARCH june forecasts. Correct them using the same error ratio they demonstrate in 2009 june forecast. Anybody who want to PROVE that I am wrong will have to wait until mid september. don’t you folks listen??? there is funding to be had…. scream and be rich..
PapyJako, statisticians would love your method. It forms an important component of statistical models. Again, I’ll call anything above 5.5M km/2 a victory for my prognosticating skills, as that puts me (just joe sixpack on the internet, paying moderately close attention) closer to reality than the median guess of the panel of 16 experts. And actually, that’d be two years in a row, and thus a trend! Who knows, if I hit, maybe Dr. Walt will ask me to participate in next year’s panel. He certainly *should* ask you. I am one who has said your 5.5M km2 is on the conservative side. Two cubes in mine Steve, and have one yourself. Thanks for dishing up the good cheer. Anyone else try looking at the DMI Website ? ? — well, DMI don’t do dashed lines. The tiny gap wipes out Today’s vertical drop. MAYBe it’s an artifact of your image system. But if you consult JAXA data, you find 2010 just had a 100,000 day (first in weeks). Gee, even yesterday was higher than its been in weeks – -beat 2007 for the second day in a row. Guess we are in for some SUNSHINE. And Pips 2.0 Displacement Chart, shows the near-random Drift of little tiny arrows has gone to good-sized ones — and MAYBE is sorting out into a pattern similar to 2007’s. Or Maybe NOT. Note if you put 2007 into the web address instead of 2010, 2007 had a few days wandering, but the next 8 are Heavy Melts. Don’t sweat the Daily Up & Down, Steve – – it’s the WEATHER. … being right or Wrong might be FATAL – – so I always hope I’m wrong. Current Odds I give for 300 mph winds … are 10% and dropping every day. But I still sweat. A lot. Have you looked at the buoy temps? Jhwa, is that a dash 13.4°C or is it negative 13.4°C?, yeah I know a dumb question but please answer anyway. Is far as i’m concerned there is no such thing as a dumb question. Steven Goddard, I am impressed, to say the least, of your work. Is it a coincidence that your surname is the same as a certain rocket engineer who was ridiculed for so long by, was it the NYT? Anyway, hopefully it will show young, inspired, wannabe scientists, how to approach a “problem”, instead of just being a parrot. I dont like parrots. Let’s hope that you’re estimate turns out to be conservative, Steve. We can only imagine the cries from the warmistas if we approached or shot past the 2007 low, no doubt accompanied by a flood of tears for the poor polar bears. Can we ask to come out of retirement and predict the ice? Paul the psychic octupus predicts 5,602,287.23705km2 +/- 18 km2. The preliminary JAXA figures for 7/20/10 show 132k sq-km lost in a single day. 2009 had 5 days in a row like this starting on 7/21/09. 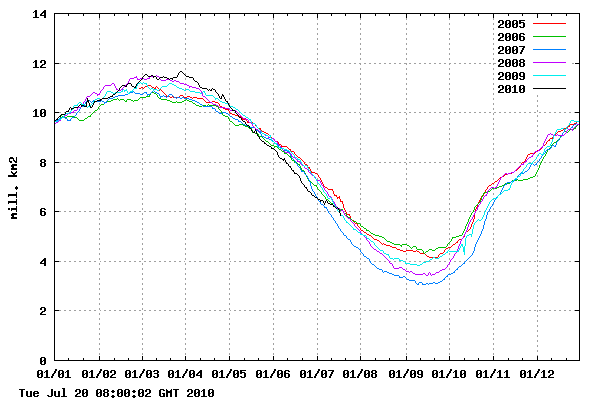 But 2009 didnt have the extent of early season ice loss that 2010 has experienced. It was still losing ice in Hudson Bay during the latter part of July, although the July ice loss in the East Siberian and Kara seas are probably looking fairly similar. Much will depend in the next 7 days on whether the rate of loss in those areas matches what happened during the same period last year. If so I think we will end the year with a similar extent to 2009. I dont think the ice loss is likely to exceed what happened last year for this period but I think there’s still a possibility the loss could be slightly lower given the Hudson Bay ice is already gone. What other scenarios spring to mind? Ice freezing in summer & melting in winter? What other scenarios spring to mind? Actually I think he might be putting the idea that there will be no winter ice into the minds of readers. Which would just be ridiculous. As you say Perry, his “possible scenario” is the only possible alternative to what we have now. I don’t think the ice loss is likely to exceed what happened last year for this period but I think there’s still a possibility the loss could be slightly lower given the Hudson Bay ice is already gone. I also updated my forecast. The minimum should occurs on 20th August. Its value is 6708821 km^2. July20-21 ______ – 103,438 _____ ? ? The weird thing is the last month Preliminaries were corrected down, about half the time — Yesterday’s was the first time I’ve seen one corrected UP. Sats show skies clearing — but for how long? Again, cold air = La Nina = SUNNY = more Melt. See Mr. Watts new Post on the New La Nina. You can take a deep breath. Even if all of the remaining ice melted in the East Siberian Sea, that is only half a million km^2, which doesn’t change anything dramatically. My forecast assumed that would happen. Well my latest forecast is 4.44E6 km^2 (standard deviation = 0.38E6 km^2), so it’s definitely less likely (than more likely) that 2010 will set a new low versus 2007. Sea ice volume anomaly is -10,600 km^3, 1979-2009 average volume for this time of year is 22,800 km^3. Thickness using JAXA data suggests an average thickness of 1.5 meters. The September PIOMAS volume data (minima) should be quite entertaining, could be as low as 7,000 km^2 based on current trend lines. The paint appears to be drying a bit faster at the moment. Been staring at the paint too much lately via MODIS. The Arctic had been very cloudy over the past 2-3 weeks, currently it appears to be less cloudy, don’t have a clue if this will continue though. Correction: 7,000 km^2 should read 7,000 km^3 in previous post. Then there’s free money for the taking at http://www.intrade.com where $55 will get you $100 if 2010 is lower than 2009 (which was about 5.4 million square km). That should be a no-brainer. By providing sources then giving a number there is the implication that the sources have a relationship to the number. Yet, I don’t see anything specific. I would think the chances are very low. More likely we will see a short upward trend in the level of ice loss and then the level of loss will reduce through August. I’m now very confident we will either match or exceed the 2009 minimum extent (more ice – less ice loss). The ice loss for 21st July was back down to 60,000 sq km btw. Cryosphere Today is showing the East Siberian Sea about 200,000 sq km above where it was at this time last year. Even if that gap was to disappear by the end of the month it would still only add 20,000 sq km a day. Looking at Cryosphere Today on a region by region basis I simply cannot see any thing pointing to the likelihood of the ice loss returning to a 80-100k per day running average. Both the Chuckchi and the Kara Seas have little ice left to lose and the Arctic Basin shows no indication of repeating the 2007 rate of loss. That’s not an up-tick. Apparently that was someone finally noticing that the unprecedented long dead-straight drop was an error, blowing off the posted 3-5 day update schedule for over a month (previous update was June 14), then “fixing” the problem. The previous graph ended at about -10.7 anomaly units (by eyeball). Between June 14 and July 17, according to this new graph, the volume continued the dead-straight drop for two weeks ending at -11.2, then suddenly reversed course and shot back up to the June 14 amount in two weeks. Yup, in the middle of the melt season the volume suddenly started increasing apparently as fast as it was previously decreasing. Extent was dropping while volume rose. So on June 14 the graph was showing -10,700 km^3 relative to that day. By the average X volume was expected on that day, Y volume was calculated instead, the difference is what goes on the graph. Thus the graph says nothing about the actual volume, only the daily variations from the daily averages. Imagine how that would work in business accounting. According to the averages derived from the previous thirty years of data, for the first week of July the company’s total assets should be $10 million. For 2010, total assets were only $9.5 million. It does not matter if in the last week of June the company had only $9.3 million thus it had gained $200,000 from the one week to the next, what gets reported is a half million loss for that first week of July. Can you imagine any company doing that? Can you imagine the resulting graph showing anything useful about the long-term health of the company? And where did they get those daily volume numbers for the 1979 to 2009 period? PIOMAS. PIOMAS said what it thought the volume should be on each of those days, now it says what the daily difference is from the average of the numbers it calculated. GIGOGG – Garbage In, Garbage Out, Garbage Graphed. PIOMAS is an anomaly graph, not an ice volume graph per se. Also, no data has changed from the June 17, 2010 update, two new data pointe were added though. Volume will continue to decrease to the annual September minima of 13.63K (1979-2009 average), which when coupled with the current large anomaly, if it continues alongthe current trend line, could go as low as 7.0K, or ~1/2 the 1979-2009 average minima. Also, no data has changed from the June 17, 2010 update, two new data points were added though. June 14 actually. And with a posted 3-5 day update schedule, to cover over a month they added only two data points? Since the graph only shows lines without points, are you sure you haven’t missed a few? Well, the daily anomalies are calculated relative to a certain day. Care to share how you obtained the volume numbers for those specific points? Anomaly is really a very useful way to think about this type of data. You know that mass will be lost as spring turns to summer, but you don’t care about the normal amount of loss. So, for each observation you are essentially calculating the difference between what’s normal for that point in the annual cycle and what’s observed in this specific instance. So an uptick in anomaly would happen any time melt slows down sufficiently, which will obviously happen from time to time as the weather changes. “Yup, in the middle of the melt season the volume suddenly started increasing apparently as fast as it was previously decreasing. Extent was dropping while volume rose.